Fox News host Tucker Carlson mocked CNN host Don Lemon for playing a “holy victim” in an epic rant on the Smollett case Thursday night. 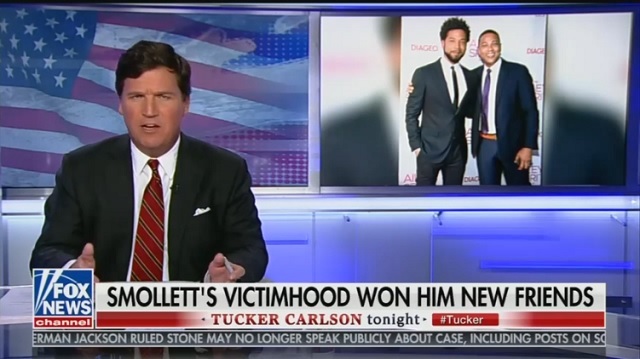 TUCKER CARLSON: Well, before he claimed that white supremacists beat him up on the street, most people had never heard of Jussie Smollett. And after he became a victim everybody wanted to be his friend. Here’s Don Lemon over on CNN bragging how he texts his new pal Jussie every single day. He’s his cell number. That’s how close they are. Really tight. DON LEMON (on Red Table Talk): My concern is for him. LEMON: And for his well-being. [Transition] Every day I say I know you think I’m annoying. I can show you the text. “I know you think I’m annoying you, but I just want to know how you’re doing. That you’re okay. If you need somebody, you can talk to me because there is not a lot of us out there.” And sometimes he responds. Sometimes he doesn’t. He responds and says, “you are not annoying”. CARLSON: “You can talk to me”, Don Lemon says, “because there is not a lot of us out there.” Well, here’s the translation. “Us” means people who’ve been oppressed in the ways Jussie Smollett has been oppressed. Lemon is letting you know he’s in that group too. Yes, he’s a highly paid news anchor with his own TV show. And yet, like Jussie Smollett Don Lemon is a holy victim. So, there’s a mad scramble over who’s the victim here. Who is the victim? Well, there is one. What Smollett did is not a victimless crime. There’s no such thing as that. An entire group of people did get slandered by this hoax. Regular people from outside the coastal cities. 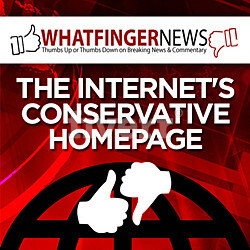 People with the wrong political beliefs and the wrong skin color. Smollett and his many defenders savagely attacked these people and not apologizing for doing it. Instead, they are telling you, and hearing it everywhere, that the real losers here are the authentic victims of hate crimes who won’t be believed the next time. Okay. That’s fine. But what about the innocent Americans they just poured venom on for two weeks because it matched some bigoted stereotypes they had about middle America? What about them? There’s no mention of them. Don Lemon would very much like to keep up those attacks on those people. Attacking them allows him to feel oppressed. That is why, when Smollett was finally caught, Lemon reacted in a puzzling way. He didn’t seem especially concerned that his buddy had lied to further divide the country to hurt America, which he did. No, that wasn’t the real problem. The real problem, according to Don Lemon is that Smollett’s arrest might discredit the cult of victimhood. LEMON: This is playing out every single moment in cable news. Sean Hannity is going to eat Jussie Smollett’s lunch every single second. Tucker Carlson is going to eat Jussie Smollett’s lunch every single second. CARLSON: Yeah, because when you tell the truth about a hate hoax you’re the real hater. With spicy hot takes like these, it’s hard to believe Carlson’s still allowed on TV!